Kalamkari design + elegant front pleating. Natural dye kalamkari tunic with notch neck and front pleats highlighted with hand embroidery. I've received several compliments on this top. I love the fit and stitched details. It is cool and comfortable and it washes like a dream! I love this tunic! Matched perfectly with the kesara pants I bought! I love Marketplace and now purchase all of my lothes through them. I get so many compliments and the clothes fit nicely. Twice I have bought the same size I always buy and both times the tops were too small so size does tend to vary. The blouse I ordered ended up being a bit too tight in the hips, so I returned it. It was very well made, but I found the quality of the cotton to be poor. I am a quilter, so I am used to working with fine cotton fabrics. This fabric was sub-par. I ordered the Saanya Tunic because it appeared to be just what I was looking for: long sleeved, relaxed fit, and color combination that was flattering to me (I am a redhead and many designs that otherwise appealed to me are featured in colors that I cannot wear). Best of all, this garment is an absolute perfect fit. 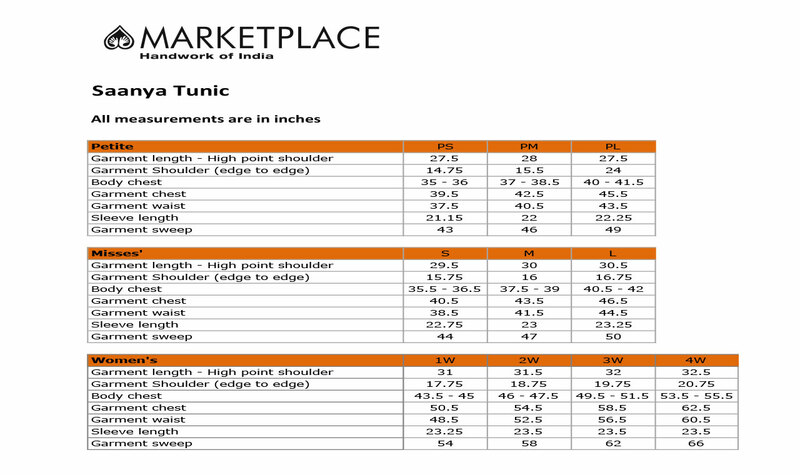 I ordered size 3X and everything about it - sleeve length, tunic length, fit across chest and shoulders - is just spot on. I am very happy with it and would like to compliment its designer and those who produced it. I hope to be able to buy it again in becoming colors like green, blue, brown and grey. Please!